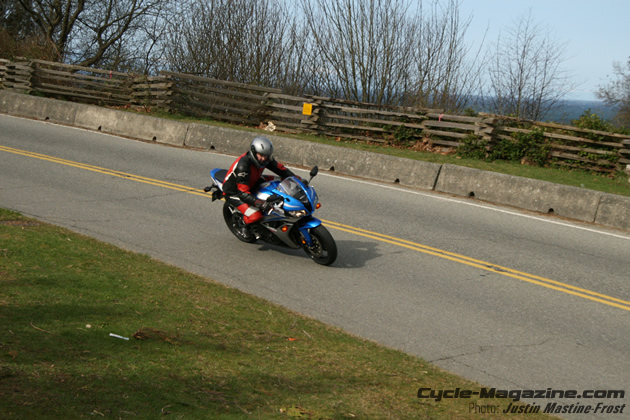 “Ah,” I think to myself, “Honda what have you done?” Our loaner 2007 CBR600RR from Carter Motorsports is blue and quicksilver, launching out of the turn in 2nd gear on a wave of rediscovered midrange torque, the tach sweeping from 7,000-11,000RPM. New lighter titanium under seat exhaust issues the lusty howl of a euphoric in-line four… the front end gets light, and then settles as the Honda Electronic Steering Damper does its job. Tight, compact, planted, nimble, superbly confident and relatively comfortable, the new CBR600RR Honda has found its road going plot on a bike that’s winning the press’s track raves – more important Honda’s found “Magic” in the CBR again. It’s easy to see where the track kudos come from; I tuck behind the screen and continue to slide up through the liquid gearbox, making like a MotoGP hero I’m not. Could it have something to do with this bike being developed in parallel with the 800cc RC212V MotoGP racer? Maybe this is the unconscious cue that shoots me through the turns in a flutter of road debris at speeds meant for cleaner roads. 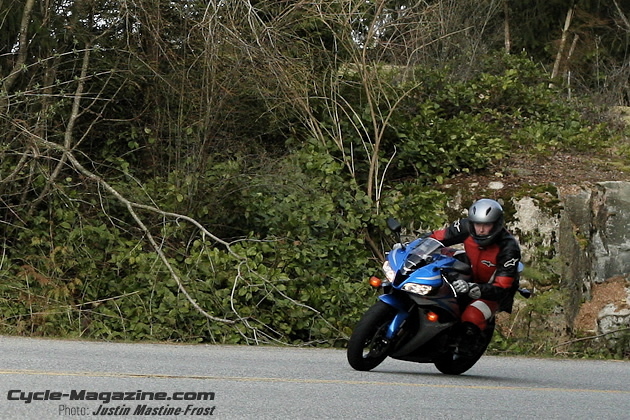 The new 600RR is unflappable, and “RR” may mean “Road Ready” as much as “Race Ready”. That’s important because according to the folks at Honda only 5% of all sportbikes ever touch the track, so the 2007 CBR600RR’s goal was to be as successful on the road as on the track. This new RR is also a rarity for Honda, a subtle admission that the 2003 through 2006 RR’s had forgotten their midrange all rounder roots and aspired only for rev-happy track glory. The result was a solid, if a bit heavy around the middle, offering that was lacking against the competition of the time. That isn’t the case with 2007’s RR, and undoubtedly Suzuki and Kawasaki have bought a few for their lab coats to pull apart while the suits fret about market share. The CBR600RR and I find a nimble rhythm flicking through the corners; the ‘07 CBR has lost 7.2kg/16lbs (claimed dry weight) over its predecessor. The quicker lighter turn-in is testament to the waif-ish 184kg wet-weight, as is the bike’s pickup thanks to an improved power-to-weight ratio. The tack sweeps past 14,000RPM and I snick the 6-speed gearbox up another – clutch-less shifting without issue. The CBR600RR will joyously soar to a stratospheric 15,500RPM before hitting the rev limiter, while the ram air intake’s furrowed brow between the headlights is worrying Al Gore by attempting to consume all the world’s air. By 13,500 we’ve reached peak output of 119bhp claimed which isn’t a ton of power in comparison to a litre bike, but unlike the 1000cc class there’s ecstasy in the spinning up rather than the disappointment of hardly used potential – the CBR600RR is much more engaging without being shift-happy. It’s an enjoyable equilibrium of horsepower and torque. For a 600, the RR’s engine bit of free revving, linear delivery is genius; spraying a stream of foot-pounds and kilowatt-Newtons across the tach from 4000RPM through to the redline. Somehow those 46.0 ft-lbs manage to feel like more – comparisons to a 750 would be hyperbole… but it is close, oh so close. Peaky 600cc power bands of the past fade into memory as quickly as traffic passed in the rear views. The only irritant is a jump in the mapping, causing an abrupt sweep from 3000 to 4000RPM which can generate a startling amount of shove in low speed traffic situations – an unfortunate mar on in city usability. 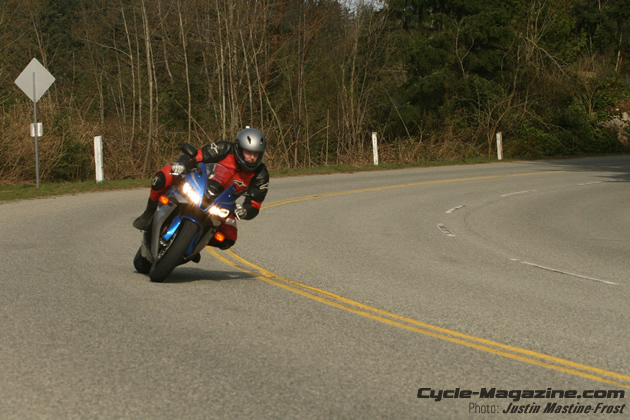 Outside the city corner-carving antics come to a close, and it’s time to scrub the speed and U-Turn for another pass. A two-fingered squeeze is all it takes, and the speed is scrubbed off efficiently. The 310mm rotors are embraced by radial-mount Tokico four-piston calipers, a set up that offers ample feel, control and power. The only caveat is on stock suspension settings the CBR600RR has a tendency to stand upright under hard in corner braking. A couple of extra rings of pre-load up to the fully adjustable upside-down 41mm forks may help sort this. Those of us not created in the image of a Honda test rider will also be availing ourselves of the ramped-preload collar for the fully adjustable rear shock. It’s details like this easy adjustment of preload, in comparison to the “get the hammer and screwdriver” threaded collars of other bikes in this class, that show how well thought out the CBR600RR is for road and track. Twentieth-century French architect Le Corbusier may have said that “God is in the details”, but he got it wrong – with the CBR600RR Honda is in the details. 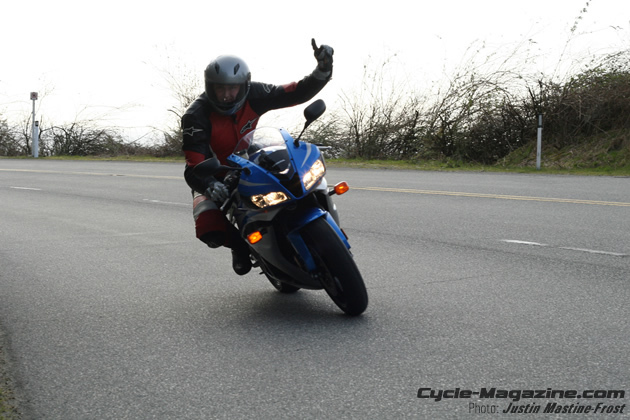 The mirrors actually give good rearwards visibility – near unheard of on a modern sportbike. The dash is nicely finished, with no exposed wiring and a clean instrument cluster and control buttons that look like they were part of the design process rather than an afterthought. It all carries a whiff of BMW about it actually, without the Germanic idiosyncrasies. Honda’s even made the roadgoing ergonomics kinder. The bars are 10mm higher making for less weight on the wrists. The seat is narrower and re-sculpted and the result is significantly more comfortable than the previous generation’s cardboard wrapped plank. The slimmer tank and frame also make the 820mm (32.3-inch) seat height an easy reach for most riders. 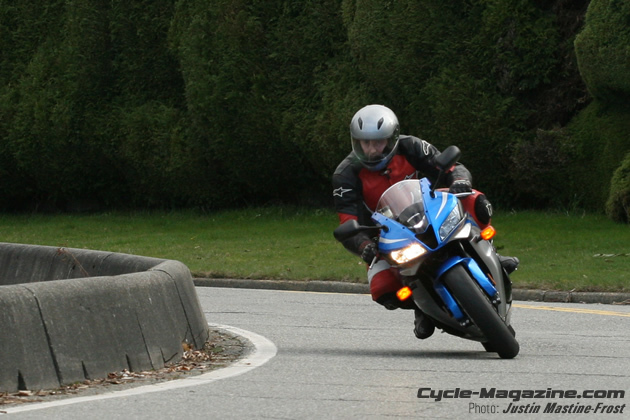 The bike’s reduced mass is immediately apparent in parking lot maneuvers, and padding around. The engine is smooth in ways 600’s aren’t supposed to be, feeling more refined like the GSX-R 750 mill, with the vibes only blurring rearward vision below about 6000 RPM. There’s even a glassy sweet spot in the range letting you glide along at 6000-7000RPM ready to pounce into screaming midrange pass at a moment’s twist of the light-action throttle. The only thing that halts the sport touring aspirations for taller riders are the high pegs which make for a cramped knee angle. Anyone under 5’11” could joyously throw on some panniers, which you’ll need as the under-seat storage capacity is limited to one set of skivvies, and dub the RR “Road Ready.” If you could stop doing multiple passes of the corners and giggling in your helmet, that is. To say the handling is assisted by the 2 inches lopped off the previous RR’s wheelbase, bringing it down to 53.8-inches for ’07, subtly increased rake, and the 2.7mm increase in trail for stability is understatement. With unobtrusive steering damping provided by the HESD, which is 25% lighter, smaller and more refined than 1000RR’s variant, the 600RR does not merely take the turns. It moves through them in a two-wheeled state of grace, flicking lightly through chicanes while remaining planted with a marmoreal solidity. Even on rough roads the CBR600RR simply gets on with the business of discreetly finding traction without bothering you with the details. The only thing missing from this alchemistic transformation of the CBR600RR from 600cc bronze to the gold may be a slipper clutch. Honda’s new IVAC – Intake Air Control Valve purportedly “minimizes torque reaction” and smoothes small throttle inputs. According to the Red wizards of Honda, reduces the need for a slipper clutch. Given the amount of rear-end upset on a “test” downshift I’m unconvinced of this technical sorcery. It does get better with a smooth release of the clutch on the downshift, but it’s just not the confident feel of heedlessly banging down through the gears and letting a slipper do the work. I pull off to make notes, and I’m struck by the look of the 600RR. Generic sportbike? The ram air intake between multiple-reflector headlights is recollects the RC51 or Aprillia Mille. The fairing sculpted for engine cooling and induction with cutouts like a supermodel’s hollowed out cheeks looks very R1. But sitting here with its forward stance and harmony of diagonal vectors, bevels, concavities, chamfers and contours all swathed in deep silver paint and blue it strikes me that with this 7th generation, the CBR600RR may define the class rather than being derivative of it. 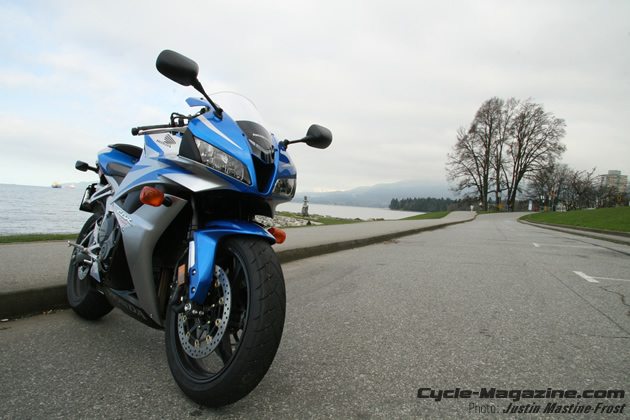 Honda claims that over 400,000 CBR600s have sold worldwide over its 20-year history. That makes it a bike of the people. 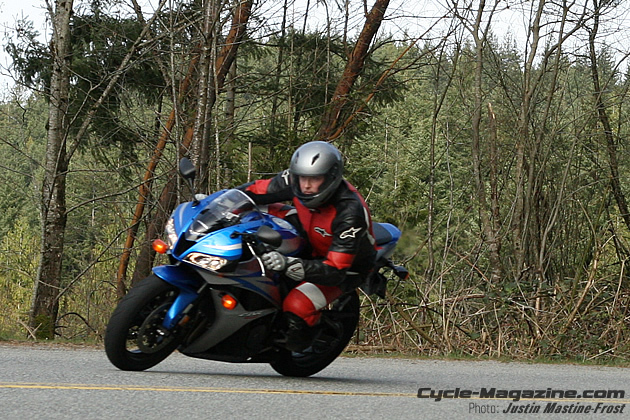 Anywhere a sportbike is ridden, likely a CBR600 has been there also. If by sheer volume alone the CBR600’s looks over the generations have been the definitive concept of “sportbike” for riding and non-riding public. 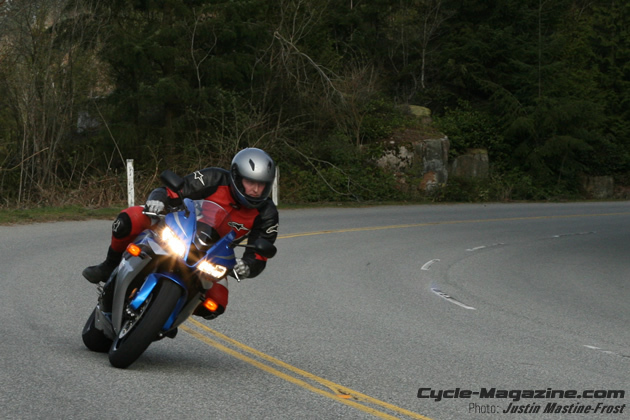 If a conversation requires an iconic sportbike, just wait an eventually a CBR600 will go by. Save for a lack of exclusivity, the CBR600RR begs the question of why move to an exotic whose design appears inspired by this exquisitely consumable package executed with build quality an entire industry aspires to? Justin Mastine-Frost jogs uphill and all I can say is “Wow! That’s a really good bike! It’s exceptional. I don’t think you need a litre bike with a 600 like this. This is way more fun! Spin it up! Thrash it! It loves it!” Normally after a second or third ride that initial enthusiasm tarnishes and then you look for flaws to balance the review out. Fast, effortless, comfortable and fun the Honda’s 2007 CBR600RR’s glow hasn’t faded – instead its road going magic continues to grow. So, “Honda, what have you done?” Well, you’ve gone and built a CBR600… a proper one. 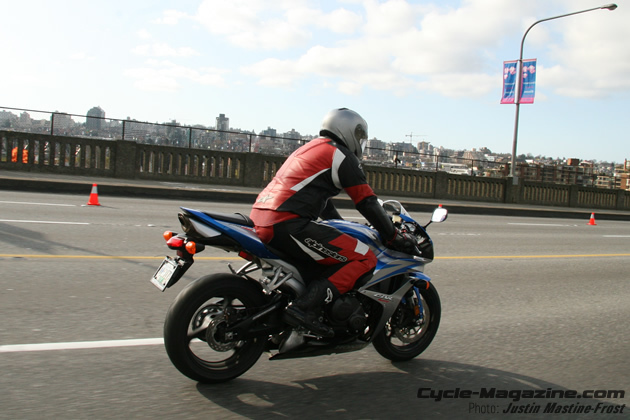 Motorsports who provided our 2007 Honda CBR600RR tester. Well said sir!!! I just purchased one used and am in total agreement. Great choice, enjoy the new ride!